Christmas Carol Singers deliver a touch of nostalgia and a heap of Christmas joy to your Christmas party or promotional event. 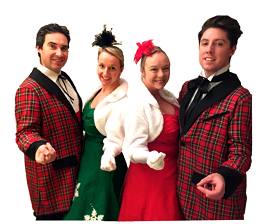 They are all professional singers, with 20+ years of experience on stage and television and they entertain guests with well-known Christmas favourites along with a few surprises thrown in. To book Carol Singers or to talk to us about your event requirements, please submit the enquiry form or call us on 087 718 1360.